The winning team from Viang Haeng Police station received the trophy from Pol. Lt. Gen. Panupong Singhara Na Ayuthaya, commissioner of Provincial Police Bureau Region 5. The Chamnan Football Cup was organized on the birthday of football fanatic Pol. Col. Chamnan Ruadreuw at Baan Kaew Sa in Mae Rim, Chiang Mai. The contest was between four teams from the media and four teams of police, five players in a team. First match started at 2 p.m. and the final contest drew to a close at 7 p.m. by which stage all teams had played each other at least once. The final result of the competition was that Investigation police A team and Patrol police A team had equal scores of 9 points each, so the situation had to be resolved by penalty shoot-out, which the Patrol police A team eventually won 3-2, becoming the Champions and first holders of the Chamnan Football Cup. The cup was presented to the winning team, with all due ceremony, by Pol. Lt. Gen. Panupong Singhara Na Ayuthaya, commissioner of Provincial Police Bureau Region 5. The Chaman Football Cup will be keenly contested between police and media every two months. The final match between Wachirawit A (right) and Rittipon (left). 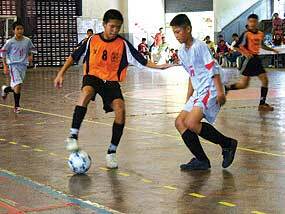 The Futsal Youth Cup 2006 was held to encourage youngsters to play sport instead of becoming involved with drugs. The contest was between 32 teams from different educational institutes and separated into two divisions; 13 and under; and 14-16 years olds. Every team played against each other, to select two teams from each group to compete in the last eight. 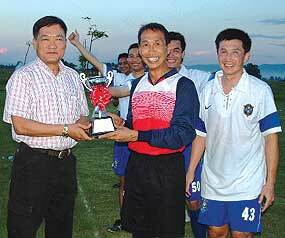 The final took place on May 10, 2006 and the winning teams of each division received 10,000 baht, plus trophies sponsored by HRH Princess Ubolratana while the first runners up were awarded 5,000 baht and trophies sponsored by Suwat Tantipat, Chiang Mai governor, with the second runners up receiving 3,000 baht and trophies from Asst. Prof. Dr. Ruangdech Wonglah, president of Chiang Mai Rajabhat University. The champion of the 13-year old division was Wachirawit A team, the first runner up was Rittipon and the second runner up was Montfort Secondary. The champion of the 14-16-year olds was Pho Karuna, while the first and second runners up were Yiamyut and Montfort Secondary. Chiang Mai Rajabhat University, Sport Association of Chiang Mai and Dontree Season jointly organized The Futsal Youth Cup 2006. AirAsia held a photo shoot at Manchester Airport with its famous Red Devil aircraft, to mark a successful first year of sponsorship with Manchester United Football Club (MUFC). Being its first Asian affiliate and as the official low fare airline of Manchester United, AirAsia has pulled out all stops to connect Manchester United with its vast fan base in Asia. Manchester United is the first football club in the world to be honored with an aircraft livery. Nicknamed the Red Devil Airbus, the 180 seater Airbus A320 bearing the Club’s crest and painted in the Club’s colors features renowned personalities such as Sir Alex Ferguson, Wayne Rooney, Cristiano Ronaldo, Rio Ferdinand, Ji Sung Park, and Ruud Van Nistelrooy. History was made on Friday, May 5, when AirAsia specially flew in the MU painted Airbus A320 from Kuala Lumpur to Manchester. The aircraft has since been at the Manchester Airport Viewing Park for the public to view. A joy ride for Manchester United fans took place on Monday, May 8 2006, through a special tie in program with Century Radio FM. In addition to branding opportunities with Manchester United, AirAsia has also helped link MUFC in the youth and sports development program in Malaysia. Working closely with the Football Association of Malaysia (FAM) as its official airline partner, AirAsia together with Manchester United is hosting a training program for the Malaysian National Under-20 team at Manchester United’s training grounds at Carrington. In addition to branding opportunities with Manchester United, AirAsia has also helped link MUFC in the youth and sports development program in Malaysia. Working closely with the Football Association of Malaysia (FAM) as its official airline partner, AirAsia together with Manchester United is hosting a training program for the Malaysian National Under- 20 team at Manchester United’s training grounds at Carrington. The CMU student union has issued an invitation to all those who are interested in participating in a swimming course to be held every Saturday and Sunday at Rujirawong Swimming Pool, CMU. There are two courses; the first course for non-swimmers, at 10 a.m. – 11.30 a.m. and 4 p.m. – 5.30 p.m. and the second course for those who can swim, at 2 – 3.30 p.m. There will be four periods; May 20 – July 8, July 9 – September 2, September 3 – October 22, and October 28 – December 17. For more information, contact Sports Department, Student Union, Chiang Mai University (P.E. building), Tel. 0-5394-3057 – 8. Just over two years ago Englishman John Moore and his Thai wife, Daeng, started teaching archery in Mae Rim ญ 12 kilometres north of Chiang Mai city ญ and in less than 12 months they formed the Chiang Mai Bow Archery Club. It hasn’t been easy introducing a minority sport to the masses, but John and Daeng have succeeded in developing a keen interest among local Thais and foreigners of various age groups. So much so that last Sunday they hosted their first Open Tournament. This latest achievement brought archers from different localities together to compete in an international field at four levels. Targets were set at 30 and 50 meters for group one and those at 18 meters were divided into three groups of men and women seniors, and mixed juniors. All participants were asked to fire a total of 72 arrows, with stabilizers and clickers banned in group one. After a rain delayed start, competitors left the clubhouse to take their aim and, despite the weather restricting practise, early scoring was of a reasonably high standard. Club member, Shinji Mikamo from Japan, put in a consistent performance to score 538 and pip John Moore to a group one first place by just eleven points. Thailand’s Chanon Punjasee wasn’t far behind ญ scoring 512 to take third. Students from Chiang Mai University faired well in both senior events. They took the first two places in the men’s when Thangachat Thanuchai shot a dazzling 572 followed fairly closely by Varanchai Thkeow on 542. As a relative newcomer to the sport, Nat Samrodpai put up a creditable display to secure third spot with a 386. The ladies from the university also came first and second. On-Anong Tipsathienkul was delighted with her tally of 506 and her colleague Sada Yoosathaporn did well to accrue 465 points. Mariko Hozu from Japan came third with a well-worked 345. In the juniors, promising 15 year old Kamalarat Supsaman ญ originally trained by John Moore - had a comfortable win by chalking up a useful 406 points, leaving Nathdanai Thongtab to fight his way admirably into second on 278, while Japan’s Takuya Kosaka came third with a steady 236. Archery is a challenging and healthy activity enjoyed by young and old alike, and being the only club of its type in the north, Chiang Mai Bow has come a long way to reach this landmark in promoting the sport. John and Daeng will be travelling to Bangkok shortly in an effort to inject further interest into what is happening here. Whatever the outcome, they have promised another open tournament in the near future, and all of last Sunday’s participants and spectators are no doubt looking forward to it. Chiang Mai University sent 193 athletes and 20 officers to the 25th University Personnel Sports Competition, the “Walailak Games” which were held on May 1-8 at Walailak University, Nakhon Si Thammarat. The athletes participated in 14 types of sports, including football, tennis, badminton, table tennis, Sepak-Takraw, snooker, billiards, Petanque, golf, bowling, athletics, aerobic dance, fencing, chess, and dance. CMU athletes returned home with the highest scores, with 84 medals, which comprised of 32 gold, 22 silver, 27 bronze, and four cups for highest total points in the male athletics event, the female athletics cup, tennis, and in the Petanque competition, giving them every reason to return to their campus justifiably proud of their achievements and of their huge medal haul. The host of this university personnel sports competition changes annually. Previously, CMU has been the host 4 times; 1988, 1994, 2001, and 2004. Swollen rivers run wild through the forest, sending out showers of spray as they crash against the rocks; and devil-may-care rafters bob and weave the rough waters as they ride the rapids in rubber dinghies. When the river changes mood to a soft flowing stream, the oarsmen can drop their paddles for awhile, rest their arms and watch the jungle drift slowly past. Shafts of sunlight rain down through the trees and as the sound of rushing water fades into the distance, the calls of birds and monkeys are heard above the rustle of the breeze. After heavy rains in Chiang Mai last year, and the forthcoming wet season fast approaching, conditions for whitewater rafting in the region could soon be the best in decades. This sport has established itself in northern Thailand over the past few years, and challenges range in grades of difficulty – one to five. 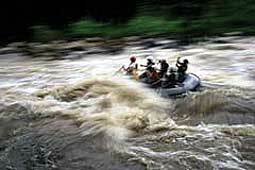 The Mae Taeng River is a popular rafting route, with rapids that vary between the first four grades. Located in a valley 75 kilometres north of Chiang Mai city, it winds down from high in the mountains near the Burmese border, through dales and canyons, past lonely hill tribe villages. And south of the northern capital, the Mae Chaem runs an exciting course through Doi Inthanon and Orb Luang national parks. The mountains get dense further west you go towards Mae Hong Son, and the Pai River smashes an angry path towards Burma. From Ban Nam Kong, 65 kilometres from Pai town, this fierce waterway thrusts downstream through forest and waterfalls, and 15 sets of rapids that test all five levels of expertise. Go northeast and find the Nam Wa River in Nan province. From its source in the Doi Nun Mountains, it flows down a route of pristine forest to remote valleys, dramatic gorges and of course, challenging waters. Most people can become a whitewater rafter, but when partaking in Thailand, it’s best to seek out a reputable operator with a TAT licence, guides, conditions and terms, itineraries, insurance and all the necessary safety equipment such as life jackets and helmets. With the help of these companies, experience is not usually necessary, as all participants are well briefed on safety and protection before setting out. However, it stands to reason that a decent level of fitness is required and the ability to swim. Age is fairly immaterial, and youngsters have been known to shoot the rapids at the tender age of ten. At the other end of the scale I guess you’re as young as you feel. After his first Thai rafting experience, sixty-two year old Robert Musibvoy from the USA remarked, “Good trip, good guides, good food and good fun. Best whitewater I’ve been on.” So he certainly enjoyed himself. Chiang Mai’s rainy season starts in May, but it’s probably best to wait until late June to July before rafting – when the waters are high. Dry cool weather takes over in mid October, and fast tides continue to flow up to February. Professional teams of fully trained guides and skippers are employed by top rafting companies operating from Chiang Mai. Two years ago, the Tourism Authority of Thailand gave the “Outstanding Performance for Inbound Tourists 2004” award to Chiang Mai Adventure, who offers an exciting 1-day whitewater rafting program on the Mae Taeng River. Siam River Adventures also provides 1-day trips proceeding down the same waterway. Where mild bumps turn to gut juggling torrents, as the river gets angry, waters run faster and the rapids become more frequent towards the journey’s end. This company’s 2-day Mae Taeng expedition can be achieved in broad daylight or for four hours under the stars in their Full Moon Program. After spending what’s left of the night in a jungle home-stay, the morning ushers in an awesome challenge of some dozen falls graded three to four. And if that isn’t enough to churn the stomach, from July they will also organize multi-day excursions down the Nam Wa River in Nan. The journey downstream builds from an easy cruise to a daunting conclusion - riding 100 rapids of all classes in the upper range. Whitewater activity has been operated on the Pai River by Thai Adventure Rafting since 1988, and they offer a 2-day expedition with overnight stay in fully equipped bamboo huts. This company claims the area to be a true wilderness, with monkeys and birds playing in the trees. Rafters can shower in fresh waterfalls and experience “body rafting” by simply lying on the water and floating with the tide.